Warner-Elliot Loop and Jicarilla. Again. This is also very near the spot where another out-of-control driver inexplicably left the loop and drove up on the sidewalk, killing jogger Rene Karlin in 2011. 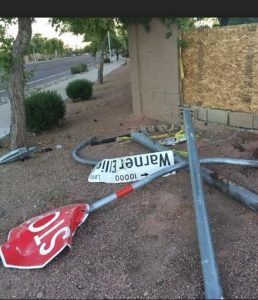 For more local shenanigans (more out-of-control drivers, killing busstops, light poles, knocking down walls and so forth), click on the ahwatukee tag.